I only saw two episodes of the TV series. But I had read the book: Stephen King’s Under the Dome. As the Dome materializes, it carves cattle in half (giving new meaning to the phrase, “thinly sliced roast beef”); planes abruptly disintegrate in the sky and the air is filled with a blood-and-body-parts kind of rain. Birds splat and slide to the ground. Trucks experience full-powered disintegration as they encounter the Dome at highway speed. Then, as the Dome is completely formed, the people inside realize they are trapped. They hammer and they pound and they scream and they pound some more, but they cannot get out. Outside the Dome, emergency crews bring explosive and military might to bear as they attempt to bust in. They can’t and they don’t–not for lack of trying, but for lack of ability to break into this completely closed system. I was at someone else’s family celebration in the not-too-distant past. The celebration was both well-deserved and well-attended. And…most of the people attending were Christians (in the they’ve-told-me-so-and-I’m-taking-their-word-for-it kind of way). I attended for two reasons: (1) I genuinely appreciated those being celebrated (they are loveable and huggable and kind and laden with been-around-a-long-time wisdom) and (2) their life achievement was a rarity in our day. I also sort of “had to” attend by virtue of my connection with those being celebrated. In the military we used to call that kind of attendance requirement, “mandatory fun.” In this case, the sweet nature of those being celebrated genuinely made seeing them fun–even if it was semi-mandatory. But, since I wasn’t part of the main family group that comprised this celebration, I was able to (read, again: had to) stand to the side. From my vantage point, I got to see an extended family system at work. It was the sort of observational opportunity that makes family systems theorists salivate. Now, these family members seemed to enjoy each other very much; they seemed to extend genuine welcome and affection toward each other. There were lots of smiles and hugs and pats on the back and bantering remarks tossed about. Many “How have you beens?” peppered the conversation. But one thing was very, very, very (yes, three “verys”) clear from the outset: this was a tightly closed system. The Dome had nothing on this group. I don’t think the folks inside were concerned about getting out. But those on the outside could not get in…at all…in any way…for any reason… (again) at all. Because, not only was this system tightly closed, those inside seemed oblivious to the presence of those outside…maybe it wasn’t actual obliviousness…maybe it was obliviousness’s more informed cousin: indifference. 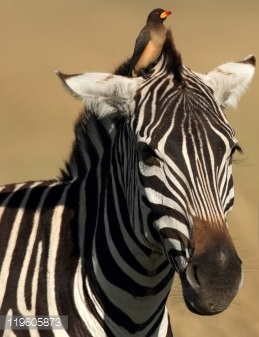 Like yellow-billed oxpeckers riding the backs of indifferent zebras, the outsiders were barely noticed by the insiders. The outsiders’ presence was tolerated but they were not taken in. We need to do something about the reality of “insider” versus “outsider”–we need to realize that, except for God’s grace through Christ, we are all “outsiders” and we’d best cast our loving embrace toward all the outsiders who come our way. “I was a stranger and you did not invite me in” (Matthew 25:43). © 2015, All rights reserved. Scripture from the NIV. There was a little boy named Cooper. He didn’t pick his name, but he thought it was very special indeed. Cooper’s mom and dad liked to take him places and show him things. But sometimes, because he was a busy boy (that’s the word his mom and dad used; Cooper thought that they wanted to use another word, but they used “busy”). Because Cooper was busy, he would like to have a toy or something else to play with on the trip. One day, Cooper’s mom and dad got ready to take him on a trip on a very big airplane. They were going to fly very far to see some people who loved them very much. But Cooper thought that it would be very fun to fly with a mouse. Now, there was no mouse in Cooper’s house (at least they thought so), so mom and dad had to find one. Where to find a mouse? And not just any mouse, but a mouse that would like to fly. So, they looked. First they looked at grandma’s house, but grandma had no mouse in her house. If she’d had a mouse in her house, she would have made grandpa take it away. There might have been some very, very loud talking about that. Then they looked for a mouse at the grocery store. Cooper wanted to ask the grocery lady if there was a mouse in the store, but mom thought that asking the grocery lady if there was a mouse in the store might not be the best idea. Cooper’s mom thought Cooper should just look for a mouse while she shopped for snacks for the trip in the big airplane. So Cooper looked and looked for a mouse in the grocery store. He was sad when they didn’t find one. So Cooper said to his mom (while she was paying for the snacks at the checkout line that beeped), “No mouse this time, Momma?” Cooper’s mom said, “No mouse this time, Cooper.” The lady behind them at the beeping checkout counter turned a very, very funny color–it was a color Cooper had never seen before. Later on, Cooper’s mom told him it was “pea soup green.” Cooper thought that he would probably not want to try pea soup after that. While Cooper and his mom were leaving the store, the grocery lady and the lady behind them at the beeping checkout counter were talking. It might have been some very, very loud talking. Then they looked for a mouse at the gas station. Cooper’s mom had driven to the gas station to get some gas for the car before they had to drive to the airport to get on the big plane. While they were at the gas station, Cooper asked his mom if they could go into the gas station store and look for a mouse. Cooper’s mom said, “Yes.” So they went inside the store to see if there were any mice. When they got into the store, Cooper’s mom went up to the cash register man to pay for the gas. While they were in line, Cooper said, “Mouse, Momma?” There were lots of people also in the line and they began to look very, very nervous. The gas station store cash register man looked the most nervous of all. And he was very quick to say (and kind of loud) that there were, “NO MICE IN THIS STORE!” He said it so loud that Cooper thought that maybe he had done something wrong, but Cooper’s mom told Cooper that everything was alright and that they would look somewhere else for a mouse. As they were leaving, Cooper noticed a couple of the people in the line seemed to get that funny pea soup color too. Cooper was most definitely, positively sure that he did not want to try pea soup. Then Cooper’s mom said that she had to go to see someone named Michael. They were driving and, when they got there, Cooper saw that Michael had a really big place with his name on the front in giant letters. Cooper couldn’t read them yet, but he saw them and his mom told him what they meant. Cooper thought that it would be great fun to put his name on his house in very big letters. Cooper’s mom seemed to know what he was thinking and said, “No, Cooper.” Cooper hears that a lot. When they got out of the car, Cooper saw that Michael’s place was just another store. Cooper was a little tired of stores by now. His mom said that it was just one more store and that they would go home after. Cooper thought he would be good for his mom in the store and that maybe this might be the place where they would find a mouse. Cooper began to get very excited about finding a mouse for the big airplane trip! Cooper saw the mouse and was very excited; his mom was excited too; but there were other people in the store who did not seem very excited. One lady (she had that pea soup green look too) dropped her basket and ran away. Cooper didn’t know that some ladies could run so fast. He also didn’t know why some ladies wear their pajamas to the store. The basket the lady dropped fell over and many little jars of beads fell out and there were beads everywhere. Cooper thought the orange beads were the prettiest. So Cooper’s mom picked up the mouse and the cheese in their little plastic package and they went to the front of Michael’s store to pay for it. Cooper held the mouse and the cheese in the package and couldn’t wait to open it up. In fact, he tried many times to open it up until his mom took the package from him and said, “Not now, Cooper.” Cooper hears that a lot. They paid for the mouse and the cheese and got in the car and went home. When they got home, Cooper’s dad helped him open the package to get the mouse and the cheese. The cheese was really big with big holes and the mouse could go in and out of the cheese and Cooper was very excited. Cooper heard his dad talk to his mom and use a word he hadn’t heard before, “slimy,” but that was OK, Cooper was always hearing words he had never heard before. Sometimes when Cooper heard a new word, his dad would be quick to say, “Don’t say that word, Cooper” (his dad would use the pretend dad mad voice, but he wasn’t really at all, ever). It made him want to say the word even more, but he usually waited until he was alone or at his mom’s and dad’s friends. When they were at his mom’s and dad’s friends, he would say the new word really loud. Cooper’s mom would get a funny look on her face. Not quite like the pea soup green, but funny. It made Cooper laugh sometimes. Anyway, the next day they all got in the car to go to the airplane. Cooper saw that nearly everything would stick to the mouse and the cheese. Cooper’s hair stuck to them. Cooper’s flannel shirt bits stuck to them. Other things of Cooper’s stuck to them too. But Cooper’s mom didn’t think those things were very nice and she thought Cooper should leave them out of the story. But after Cooper’s dad used his pretend dad mad voice, Cooper was sure he saw his mom and dad look at each other in the mirror in the car and laugh. Cooper’s mom and dad don’t think Cooper sees what they do or say in the mirror, but he does. They got to the airport, which was big. And they went inside. Cooper’s mom told him to put the mouse away in his bag so it wouldn’t get lost in the airport. Cooper thought the mouse would get lonely. But then he thought the mouse would just play with the cheese and be OK. Cooper was so excited about the airplane ride that he almost (but not quite) forgot about the mouse during the whole trip to the faraway place to see the people who loved him very much. They got to the faraway place after a very long time on the airplane and in a car. Cooper didn’t know how long but he could tell it was a long time because his mom and dad didn’t seem to be as happy as they were when they got on the plane. They met someone named Gramps and Granny Laura and they went to their house to stay. When they got there, Cooper opened some presents and found a favorite one–he called it his keytarcar because it looked like a guitar and a little piano and it made very, very, loud electric noises. Cooper liked to play and sing and dance with his keytarcar. Cooper’s dad said to Gramps, “Thanks a lot.” But he didn’t sound like he meant it; at least not to Cooper. Cooper played with the mouse some more and then it fell on the floor. Cooper’s dad picked up the mouse and gave it to Cooper and said to be more careful. Cooper heard that a lot. But Cooper kind of liked this new game and so he played with the mouse some more and then it fell on the floor. But this time his dad didn’t pick it up! His dad said he couldn’t see where the mouse went! Cooper was very upset. Cooper was crying his very upset cry. So they all looked and they looked and they looked and they looked but nobody could find the mouse. Cooper was very upset. Then, Cooper’s dad thought (he got that funny look on his face when he was thinking). Sometimes Cooper thought that his dad’s thinking look looked a lot like his dad’s going to the bathroom look but he never told his dad that. Anyway, Cooper’s dad said to Cooper, “I think the mouse is going for a trip on the train by himself.” Cooper thought about this for a minute and wondered why the mouse would want to go on a train trip by himself. Then Cooper thought that his mouse was very special. Sometimes he heard his mom and dad say that his mouse was special but they said it in a funny way that didn’t seem to be quite what Cooper was thinking. Cooper thought that a special mouse might want to take a train trip by himself. But Cooper wondered where the mouse would go. Cooper’s dad thought about that and said, “Well, maybe the mouse is going to see your cousins in Oklahoma!” Cooper didn’t know where Oklahoma was but he knew he had cousins there. He didn’t exactly know what a cousin was, but he knew that he had some. They were all older than he was. There was Shelby and Seth and Sophie and Staysha. Cooper knew that all their names began with the same letter but he didn’t really know his letters as much back then. And he wondered why, with so many letters (at least he thought there were a lot of letters), his cousins had all used the same letter to start their names. His cousins had adventures too. But they were usually with a six-foot tall chipmunk with a one-string ukulele and an 88 key piano playing platypus. But that is for another story. Cooper thought that it would be fun for his mouse to go to see his cousins. Cooper wasn’t as sad anymore. He was still a little sad because he missed his mouse, but he thought that, if his mouse was anything like him (and the mouse must have been like him because they played so much together), then the mouse would want to go on the train and see other things and people and his cousins and his dad’s stinky sister. Cooper didn’t know if his dad’s sister was really stinky (and if she was stinky, if she stunk like Cooper did when he was stinky). Cooper thought that maybe his dad was just being funny. Cooper couldn’t always tell when his dad was being funny. Nobody could. Then Cooper thought maybe he’d have a stinky sister someday. But he didn’t tell his mom and dad because they sometimes said in the mirror in the car that they didn’t know if they could handle two of him. Cooper’s mom’s eyes got all big! But he knew they would. They loved Cooper so very much and besides, with the mouse gone, Cooper would need someone else to play with. Cooper hopes to hear more about the mouse someday. Cooper would like to play with the mouse again. Maybe he’ll find the mouse in Oklahoma. If you see the mouse, please tell him to call Cooper and let him know that he’s alright.